What Does Mobile Hair Salon Mean? Easy. It means that I come to you. My van is fully outfitted with all you need for a professional cut, style, or color. I can meet you at your office or your home. If you are seeking a personal, professional, quiet and peaceful experience, you are at the right place…I look forward to meeting you. I serve clients in Santa Rosa, Sebastopol, Rohnert Park, and Sonoma. I won’t ever let anyone else touch my hair. Debra is the best stylist and colorist I’ve ever had. I’ve been driving more than an hour to see her for 17 years now, and won’t ever let anyone else touch my hair. Debra is great with my hair! She always has time to discuss and makes great suggestions. I highly recommend her. Each and every hair cut and color has been amazing. I can’t wait to have her do it again! I highly recommend Debra’s Corner to anyone looking to improve their hair. I’ve been with Debra for about 4 years, now, and I expect to be with her many more. She cares a lot about my hair and suggests the best products to use. I highly recommend Debra’s Corner to anyone looking to improve their hair. Finally! It is such a relief to have found someone able to style my hair so that it suits my facial features! From a very short cut through the growing-out stages (which can often be awkward!) Deb has managed to create beautiful and lasting styles that can be wash and wear or styled for special occasions. I’m always getting compliments about how my hair is colored and styled. Great cuts, convenient scheduling, and she’s really nice too! I’m so happy I found Debra. She relaxed my hair with Keratin and later I went back for a cut and am so pleased with it. She has a nice, easygoing way – lovely to be with, great prices and knows her stuff. Highly recommend! Great as always, thank you for being the best hair expert around. No one touches my hair but Debra. Feeling beautiful again because of Debra! No one touches my hair but Debra. Thanks, Deb, you’re the best! She gave me the best haircut I’ve had in years. Honestly I was weary about going to a new hairdresser, especially when the last person butchered it twice. WHOA, you should see how Debra cut my hair…Amazing, and a few days later I called her to thank her for the great haircut. What a great find Debra’s Corner is. Debra has consistently been responsive to my request for a cut. She is quick but thorough and if I want something changed a bit like shorter bangs she does it with no questions asked. I would and do recommend her to anyone wanting a cut that not only looks good when you leave the shop but still looks good 2 months later..
I’ve been seeing Debra for over 10 years. Debra always does a wonderful job with my hair. I leave feeling neat, cleaned-up, and professional. I’ve been seeing Debra for over 10 years. My hair always looks wonderful after she is done. Debra is great about listening to what you want done for your hair. My hair always looks wonderful after she is done. Debra is great! She takes the time to listen to what I would like to do with my hair and has the skills to do it! Debra is both a fine hair stylist and a wonderful person. I have gone to her for years now and I intent to continue for years more. I’ve gotten several haircuts and keratin treatments with Debra, and I couldn’t be more pleased with her skills and service. I have frizzy, wavy, unruly hair, and not only has she given me the best haircut I’ve ever had, she always gives me tips on how to make my hair more manageable. Highly recommend! …she works her magic and somehow I always leave the salon feeling beautiful! How refreshing to have a stylist who knows what she’s doing. How refreshing to have a stylist who knows what she’s doing. 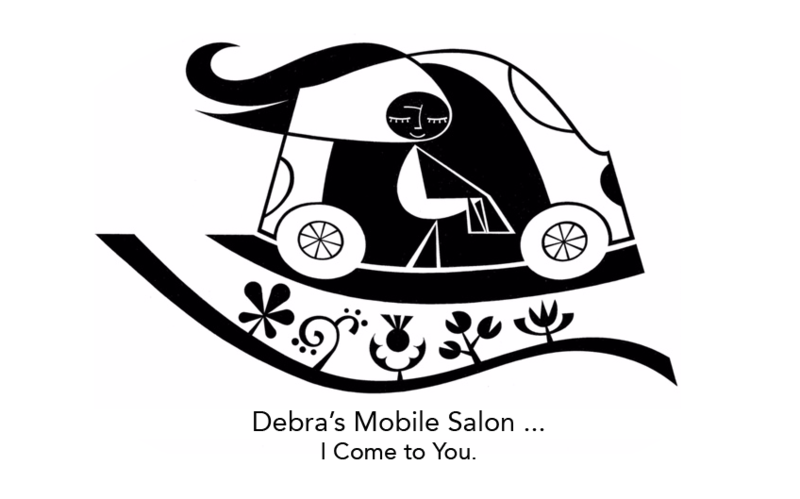 Not only do I look great whenever leaving Debra’s, but I also benefit from both her ever-present intelligent conversation and mobile salon. Debra still provides excellent service and really knows her craft. She just gave me a new cut and it looks great and was exactly what I wanted. She really listens to her clients! I just love her she is amazing person and hair stylist!!!! Debra is always listening and making sure I’m happy with the cut and color! She is also always happy to make changes and touch ups without charging for it which is great! I just love her she is amazing person and hair stylist!!!! I have been going to Debra for a couple of years now with great results. Are you not finding your preferred time? Reach out!